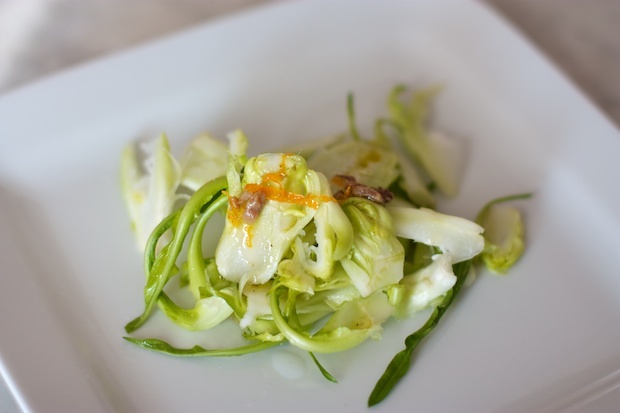 If you happen to go to Rome for a short stay between November and March you will certainly find puntarelle in restaurants and vegetable stands. 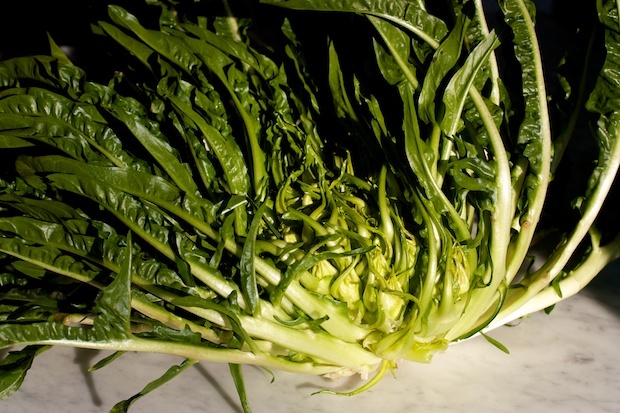 Puntarelle are a chicory variety which contains a heart composed of many protuberances. If the chicory is fresh you can use the entire plant. The large outer leaves can be boiled and seasoned with olive oil and lemon, while the interior can be used raw in a pleasant salad that can be served as an appetizer. 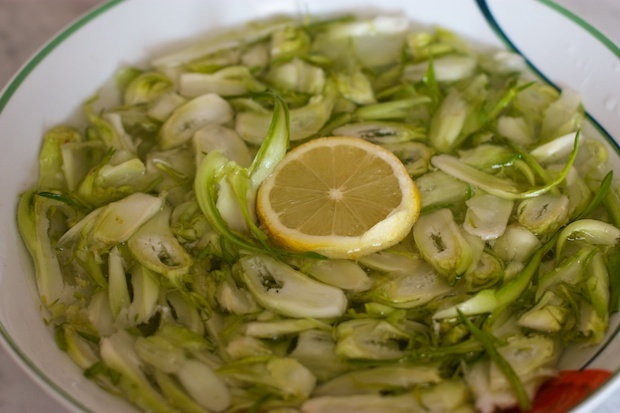 It is said that puntarelle as well as being depurative, diuretic and laxative, due to the particular acid that characterizes the bitter taste, is also an aphrodisiac. So it may be an idea to open the dinner on February 14 for Valentine’s Day. For some years puntarellecan also be found in shops in Friuli, so I would like to propose that this recipe that is a classic of Roman cuisine and I have added in grated orange peel to mitigate the bitterness. Cut the chicory leaves and remove the hard bottom part. Prepare a bowl with cold water and the juice of 1 lemon. Cut the chicory into thin slices and put them in water and lemon juice for at least an hour. This way it remains crisp and loses some of its bitterness. Meanwhile, cut the anchovies into small pieces, add them in with the oil, a little salt and pepper in a small bowl. Add the zest of the orange. Allow to marinate. Remove the vegetables from the water, dry quickly in a cloth, place on individual plates. Drizzle with the sauce and serve immediately.